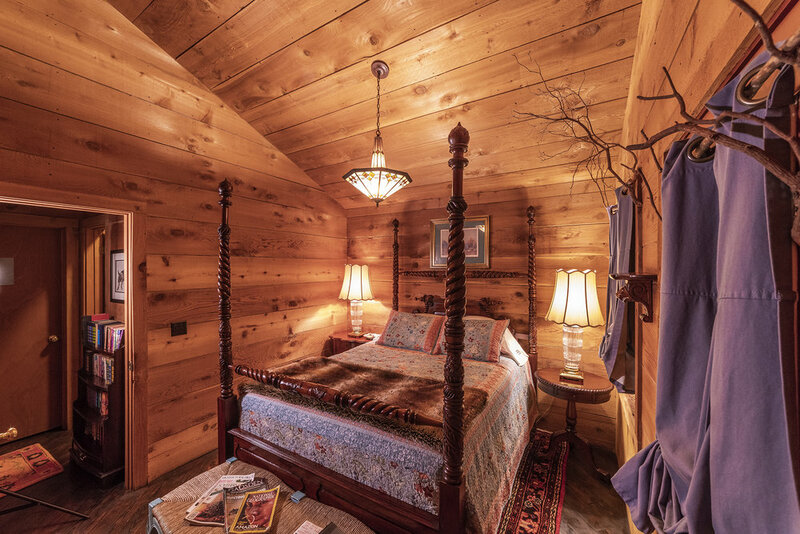 Rest & relax in one of our two cozy cabins; "Bringing Up The Moon" and "Bringing Down The Sun" located at the north end of the conservatory to ensure maximum privacy. Your own private haven! Available by reservation year round - except for February. Constructed inside and out of Western Red Cedar, with vaulted ceilings, stone fireplaces and hardwood floors. 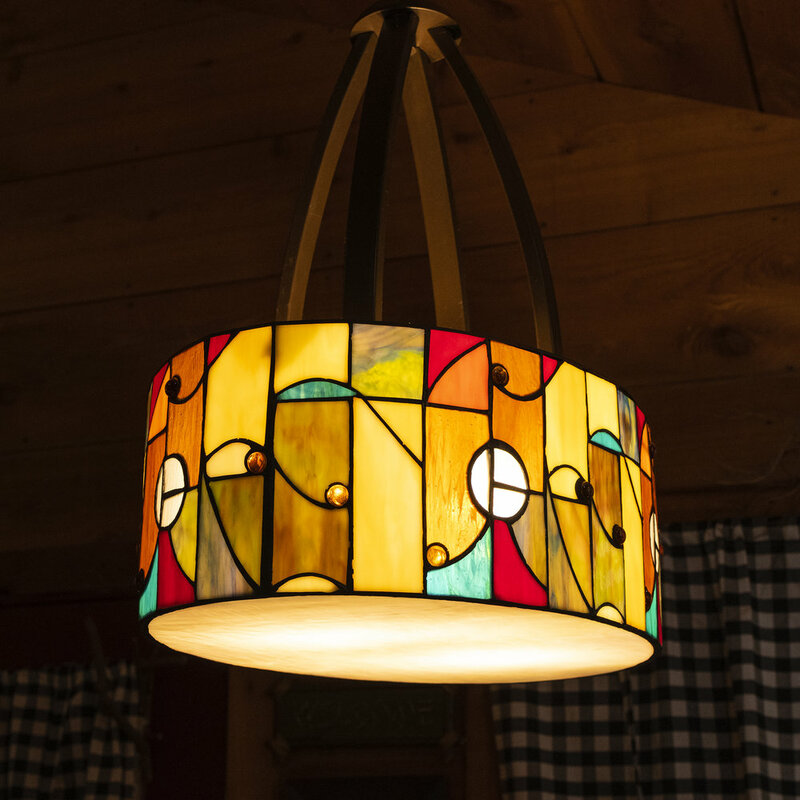 The details of hospitality are unsurpassed - comfy throws, Tiffany lamps, books, and magazines, and welcoming refreshments. 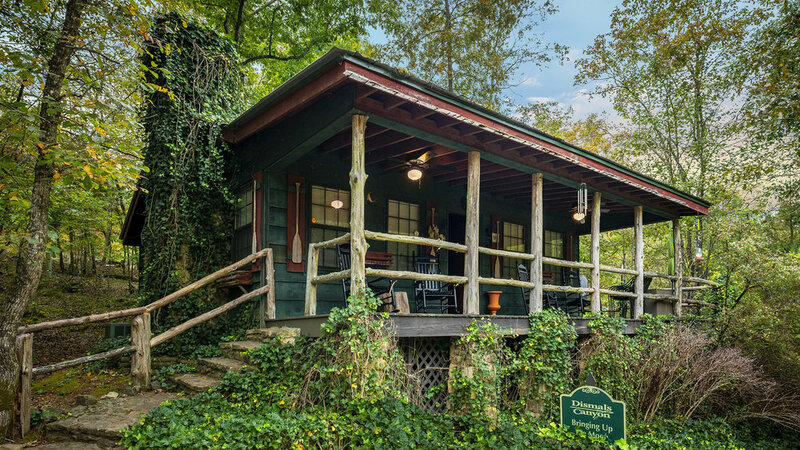 Everything is furnished from rocking chairs to freshly ironed sheets. A complimentary wine basket (wine, cheese, & grapes) awaits your arrival (for guests that stay 2 or more nights). Bathrobes, towels, bath cloths, etc. * Fireplace: One box of wood is furnished at no charge. Extra wood available at Country Store for $25 per box. Only available October through April. ** Fire-pit: One bundle of wood is furnished at no charge. Extra wood available at Country Store for $5 per bundle. Only available October through April. There are 2 cabins. Both share the same floor plan. Cell phone signal strength is almost non-existent at the Cabins. Signal strength is good in the main parking lot near the Bath House/Restrooms. 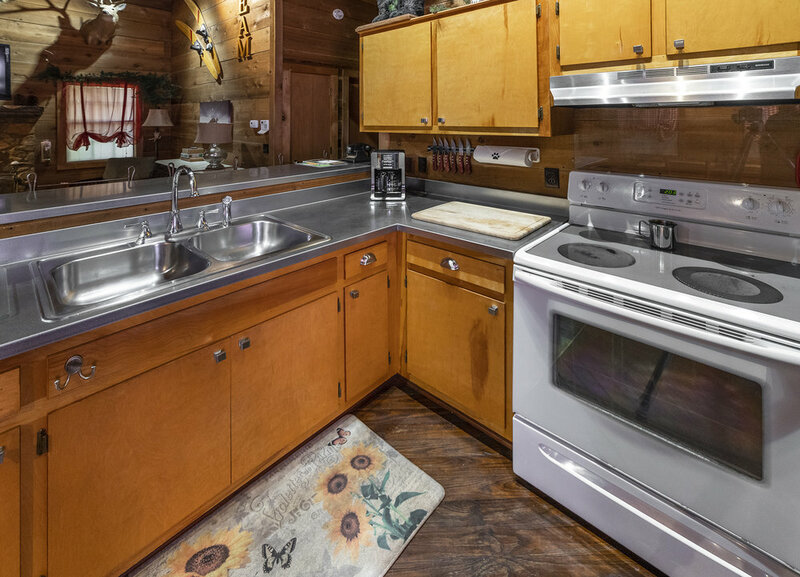 Each cabin is furnished with a land-line phone. There is no charge for local calls. Long distance service from your cabin may be accessed by use of your credit card or collect. In cases of emergency, 911 service is available. Fire-pit wood cannot be burned in cabin fireplace. It is pine & will smoke up the cabin. Violation of this will result in forfeiture of damage deposit. 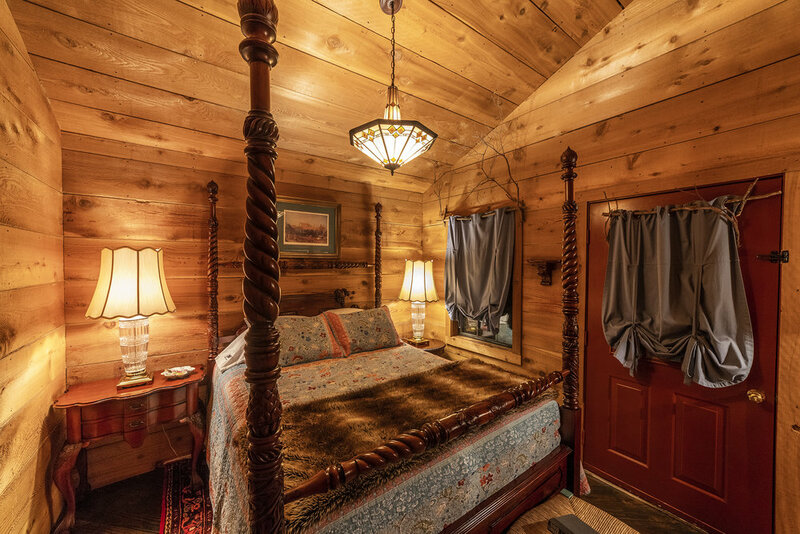 When, for no rhyme or reason, you just feel the need for a quick getaway check out our "Wild Hare" rates, which offer the best value for a great escape. The dates for these rates are dynamic, so check back often for current dates. To book your escape call 205-993-4559. HOLIDAYS require a 3 night minimum stay. THE MONTHS of DECEMBER, JANUARY, and FEBRUARY require a 2 night minimum stay - on weekends or during the week. $100.00 for 7 to 8 people. 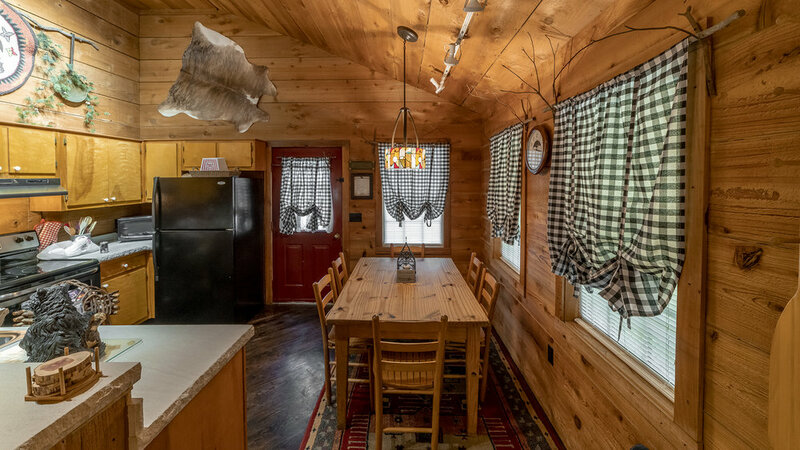 Each Cabin requires a damage deposit in the form of a personal check, money order, or cashier's check (credit cards not accepted) either before, or at the time of check-in. $175 if made by personal check. $185 if made by cash, money order, or cashier's check. Refunds of all deposits other than personal checks will be subject to certified returned postage fees. This deposit cannot be refunded at check-out, but will be refunded within 10 days of your departure, if there has been no damage or excessive cleaning required at your cabin. 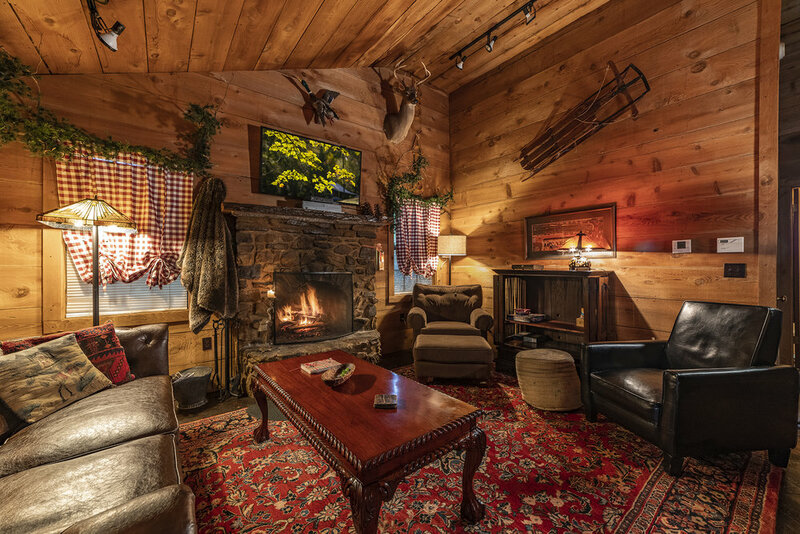 Violating the Pet Policy, building fires in the fireplace between May 1 & October 1, or exceeding the maximum occupancy for a cabin will also result in the forfeiture of the damage deposit. One person in your party must be at least 21 years of age. Pets up to 50 pounds are permitted for an additional one-time clean-up fee of $40.00 per pet, per cabin. An additional damage deposit of $75.00 - per pet - per cabin - is also required. This damage deposit will be refunded pursuant to the terms stated above under SECURITY / DAMAGE DEPOSIT. Pets must be on leashes at all times. NO PETS may be chained/tied anywhere outside the cabin. Limit 2 pets per cabin. No camping and cabin reservations for the same dates. Reservations may only be made by credit card - Visa, Mastercard, American Express, Discover. The total charge for your cabin reservation will be billed to your credit card at the time the reservation is made. Cancellations affect us significantly because of our size. Therefore, we adhere to a strict cancellation policy. Cancellation of a confirmed Cabin Reservation must be made at least 30 days prior to your arrival date, except on Holidays. Holidays require that the cancellation be made within 45 days of the date of arrival -- holiday covers 5 days preceding the holiday and 5 days following the holiday. Cancellations, regardless of the reason, made within 30/45 days of your arrival date will result in forfeiture of your total deposit, less cleanup fee & damage deposit. NO CANCELLATION is allowed for any reservation made less than 30/45 days in advance. All reservations/deposits are non-transferable to another date. However, you are welcome to send a friend or family member in your place. All reservation cancellations are subject to a $50.00 administrative fee. All campers & Cabin guests must check in by 5 pm Sunday-Friday & by 7 pm on Saturday or incur a $25.00 late check-in fee. Check-out time is 11:00 am. There may be occasional check-in delays during times of heavy departures. Our staff will do everything possible to minimize your inconvenience and to make you comfortable during your wait. No refunds will be given for early departures. Any violation of these rules will result in immediate eviction from the cabin with forfeiture of all fees. Dismals canyon is not responsible for accidents or injury to our guests or for loss of money or valuables of any kind. Sit back, relax and have a great time. Our staff is here to serve, so if you forgot something or need something, just let us know. The swimming pool and the Canyon Floor are closed to all guests at sunset. Do not put cigarette butts, tampons, diapers, paper towels or anything except toilet tissue in the toilets. We use septic tanks which cannot dispose of other materials. Remember you are in a National Landmark, when the septic systems are damaged, the environment is damaged. No pets may be tied or chained at anytime. Do not wash plastic utensils or plastic handled utensils in the dishwasher. Do not put food, greases, paper or other non-liquid material down the sinks (drains). Garbage pickup is provided. Put all trash in large garbage bag and place in large garbage container at edge of driveway. Do not chop or cut things on the countertops. Use the cutting board. Do not hang clothes on deck/porch rails. Hang wet clothes in bathroom on clothesline. Do not jump on beds. Do not climb or sit on deck/porch rails. Do not walk or play in flower beds. Do not block driveway - park in designated spaces only. All cabins visitors must register at the Country Store. Parking is limited to 2 vehicles per cabin. Additional vehicles park in the parking lot at the entrance to the conservatory. Open the Damper before building a fire in the fireplace. Do not build fires in the fireplace between May 1 and October 1.